Ohio State women’s soccer’s Friday game proved to be a milestone occasion. The Buckeyes used two goals from junior forward Lauren Granberg to defeat the Fighting Illini, 2-1, on a chilly Friday night at Jesse Owens Memorial Stadium for the 200th victory in the program history. Walker, who has been a part of 164 of the 200 Buckeye wins, said she was especially happy that this milestone occurred on the team’s alumni weekend. Senior goalie Katie Baumgardner denied seven Fighting Illini shots, six in the second half with OSU protecting a one-goal lead. “I was just trying to get a hand on everything and anything,” Baumgardner said. OSU held Illinois well below its average of 3.33 goals per game. The Buckeyes (6-3-1, 1-0-1 Big Ten), broke a 1-1 tie in the 56th minute when senior forward Paige Maxwell played a cross that found the head of Granberg, who leaped between two Illinois defenders to finish her second goal of the game. The assist was somewhat of a redemption for Maxwell, who minutes earlier had hit the post with a header off a corner kick. Granberg’s first goal opened the scoring in the 25th minute. OSU defender Megan Fuller sent a long pass that was flicked by Maxwell and found Granberg in the center of the box. With her back to the goal, she was effective in shielding her defender from the ball while turning to fire a shot from just outside the six-yard box to put the Buckeyes up 1-0. The Fighting Illini (6-3-1, 0-1-1 Big Ten), leveled the game in the 37th minute when an attempted clear was deflected back into the box to a wide open Jannelle Flaws. The Illinois forward put a ground shot to the right of a diving Baumgardner for the equalizer. 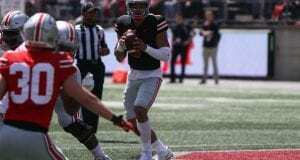 The Buckeyes continue conference play Sunday at Jesse Owens Memorial Stadium as they take on the Northwestern Wildcats at 12 p.m.